After graduating from Madison-Ridgeland High School I had an appointment with destiny, and I’ d decided that joining the Air Force (USAF) was the best way to keep that appointment. While in the USAF, I joined some local R&B bands and played gigs around the South Florida area. I was stationed at Homestead AFB near Miami so there was no shortage of music events to keep me occupied during my off duty time. In 1983, after 4 years in the Air Force, I realized that life wasn’t my bag so I left vowing to never return. I went back to Madison, MS. Needless to say the pace there was much slower than what I had become accustomed to……..18 months later I was back in the military, but this time I joined the Mississippi Air National Guard, (MS ANG). You see, I knew the Air Force way of life now and thought it would be good to supplement my income with a monthly drill check while I worked and used my GI bill to attend college. Things seemed to be moving right along, until one month, I reported for drill and realized that there was a promotion ceremony commencing that day. Two young Sergeants were being promoted to Staff Sergeant. While I was happy for them, I also had questions as to why I hadn’t been considered for promotion as well. This was the first of a series of questions I posed to my superiors that finally got me an audience with the unit Commander. This very ‘ interesting’ conversation where my questions did not receive satisfactory answers, ended with my asking the Commander for a release from the MSANG. This allowed me to join the Army National Guard. You see, I couldn’t accept the fact that I wasn’t considered for promotion when I knew I had met all the requirements. I wouldn’t have minded it if,, after being considered, I had been found unworthy of promotion, but, to be dismissed without consideration was unacceptable to me. It’s also important to note, that the two Sergeants who were promoted were less qualified than I, and Caucasian. I left the unit that afternoon and went directly to the Army National Guard Recruiter. While still in my Air Force uniform I told the recruiter, I wanted to join the Army National Guard on the condition that I could compete for the Officer Candidate School (OCS). After an interview with the Company Commander, I joined, completed testing, met all requirements and entered OCS at Camp Shelby, MS in 1986. In 1987, after being commissioned 2nd Lieutenant, I couldn’t resist the urge to visit my old Air National Guard unit during one of their drill weekends (in part to offer hope to others like me). Additionally, to show the unit’ s leadership they didn’t hold ALL of the cards. In my thirties, after leaving the USAF and while continuing to serve in the Mississippi Air and Army Nation Guard, my full time job was with the Mississippi State Capitol Police Department in Jackson, MS. They hired me on as a Patrolman and sent me to the State Police Academy. The military-like structure at the academy was easy for me and I did well in the program. By then, I had begun singing in the gospel choir at my church and although I had developed a real love for Jazz, I hadn’ t started singing it publicly. You see, as I alluded to earlier, in my Mom’ s house, Gospel music was Godly (Good) and every other music was ‘ The Blues’ (Bad). Literally, those were the only two types of music, in the world as far as my parents were concerned. I understood, but I didn’ t agree. As I became an adult, the influences of my childhood still had impact but, not control. I initially loved Jazz and avoided Blues, until I realized that without Blues there would be no Jazz, just the same as without Gospel there could be no Blues. Things began making sense to me in a totally different way. The whole Gospel-Blues-Jazz kinship is so much more than what I had understood in church as a child. After joining the Army National Guard and becoming a Military Police Platoon leader I got a job offer that required me to move to Georgia. 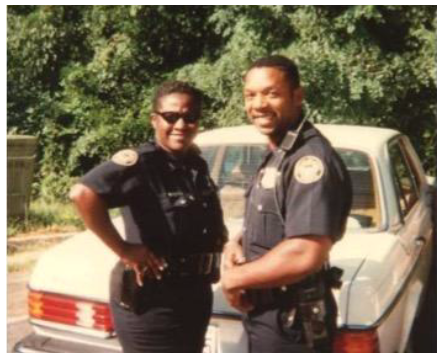 The offer was from the Atlanta Police department and after thinking through my options; I took the job and moved to Atlanta in 1988. My time with APD was at times very fulfilling. I often felt as if I made a difference. Sometimes the difference was my preventing children from being abused and adults from being harmed. As often as I could, I spent time with the young kids and those more environmentally challenged. I wanted to help them find their way out of the projects while bypassing the prison system. I felt that most of those kids were exposed ONLY to a reality which was crime laden and offered no way out but through the criminal activity portal. I had a female partner who felt the same way and we developed programs to expose these kids to other options. We would bring various tradesmen and women to speak and mentor the kids. We both knew we couldn’ t save them all, but I know that some of them got it. It was very rewarding to be providing other options to these disadvantaged children. Eventually, I left the Atlanta Police department as I came to the acceptance that the criminal justice system was perfectly content with reacting to criminal activity and ill equipped in preventing it. This realization frustrated me a great deal. I finally chose to move on to pursue other passions and Jazz was right there waiting for me, almost as if it knew I was coming. Embracing the music and immersing myself in the culture so that I would learn as much as I can from everyone I could. I often had to seek out the ‘ real’ Jazz people, but once I found them they eagerly shared their knowledge with me.I still do this today and I’ ve found that every time I find a real Jazzhead he/she also has a deep love for the Blues. One Jazzhead told me “You see Lu, the Gospel and the Blues got together one night, and they got a little frisky towards each other…. nine months later they had a little brown baby, and the called it Jazz”. My friend Henry Davenport shared that analogy with me one night while we talked at his Jazz spot in Atlanta, and I think it sums up the origin of this music quite succinctly. Henry is also the first person to ever refer to me as ‘ Sweet Lu’ . I didn’ t really care for the moniker and I told him so, but that didn’ t stop him and eventually all the other cats started using it. Today I use the stage name ‘ Sweet Lu’ in tribute to Henry, he’ s a Real Jazzhead and so am I.